Last weekend October 24-25 at the Corner Bank in Scarborough, Ontario the first installment of the 2015-16 G.T.A Snooker Tour was held. This was the opening event to the highest paying snooker tour in Canada since the North Americas snooker tour in the mid 90's. 46 players turned out for the 6 red handicap event which had handicaps ranging from -4 to +28. For those not familiar with this style of handicap tournament, players spot the difference between handicaps for example if a +4 plays a +12 the higher handicap would receive an 8 point spot. The first 2 rounds were a best of 5, the quarter finals were a best of 7 and the finals a best of 9. 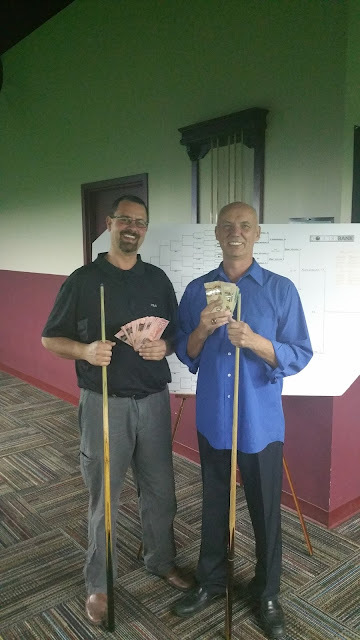 Entry for the event was $200 and the Corner Bank added $1000 to the event creating a healthy $10 000 total prize. Most of Ontario's best players were on hand including snooker legends Floyd Ziegler, Chris Wood and Mario Morra along with current Canadian snooker champion John White, Alan Whitfield and Jason Williams. The handicap committee had a bit of a tall order on their hands assigning all of the handicaps as there was only limited data to determine everyones handicap but in my opinion at least 90 percent of the handicaps were issued correctly and those that were questionable were very close. The first round saw one major upset between John White and Gabriel Brunning a young player originally from Brazil now living in Missisauga, Brunning played an excellent set trailing in 2 games going into the colours he gained the advantage and ran the colours in both those games and came out with a surprising 3-0 victory. Brunning was a 10 handicap and the inevitable murmuring about a player with a handicap that was to high was heard amongst the crowd however in the next round he showed his overall level falling to Shane Gummerson a 20 handicap by a 3-1 score line. Although it was a random draw the low handicaps ended up being divided pretty evenly throughout the field. Floyd Ziegler started his run to the final including a win over snooker veteran Terry Davidson. Another tournament favourite Jason Williams had wins over Ray Jansen, Steve Fuldi, myself and Shane Gummerson on his way to a semi-final match up with Ziegler in the top half of the draw. On the bottom half 2014 Canadian snooker champion Al Whitfield was cruising along nicely all the way to the semi-finals and surprise of the tournament Dan Bisonette from Sudbury, Ontario was turning heads. First notice that he would be a force was his final 16 victory over Justin Kluznik right after Kluznik had just beat Rob Hall 3-0 in the previous round. It appeared that there was a small oversight in assigning Bisonette's handicap and in all fairness he was really an unknown commodity in the field being from out of town and by no means a regular competitor in any major snooker tournaments in the area. The semi finals were Floyd Ziegler vs. Jason Williams and Dan Bisonette vs Al Whitfield. Ziegler advanced to the final by a 4-3 score line and Bisonette rolled over Al Whitfield 4-0. In the final match Ziegler showed his wealth of experience with a 5-2 victory and the title for the first ever event on the GTA snooker tour. Special thanks to the Corner Bank and tournament director Jim Wych, we hope to see more "9-ball players" and players from out of town including Quebec getting involved in the future. The prize money is high enough that players can afford to travel to these events. The next event will be at Monte Carlo billiards in Mississauga,Ontario in January.